I took the daily special of linguine with Sicilian red prawns. I liked the flavors here, with the sweetness of tomatoes plus the goodness of shellfish in the sauce. Unfortunately the prawns were a little mushy, although they still tasted fine. Rigatoni alla Norcina piccanti - I also took a bite of my friend's other pasta. Not bad at all. I love the Tuscan sausage and the spicy tomato sauce. 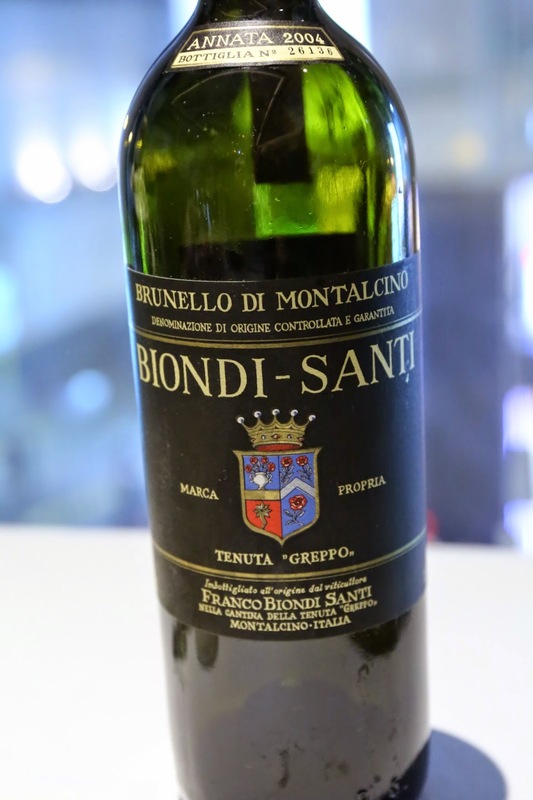 2004 Biondi-Santi Brunello di Montalcino - this wasn't the Riserva, so it was accessible immediately after decanting. Very sweet on the nose, and slightly sharp and alcoholic at first. Nice and fragrant nose of forest and black fruits. A very nice and enjoyable dinner. Nothing here was mind-blowing or on the cutting edge, but I thought the food was generally pretty solid and reasonable for the price. Given the dearth of choices in town when it comes to Italian cuisine, I think this is a place I can certainly come back to more often... especially given its location.